With the aid of Visiminds services and technology you will be able to quickly produce a current map of your assets. You and your organisation will avoid misinterpretation and preconceptions. With the exact coordinates, images and measurements the contents of your information system will be more accurate. From these images you will be able to discuss, control and communicate. Budgeting and planning can be done more efficiently. Information about road lane is obtained from a moving vehicle or on the helicopter deck. Data collection is possible at any time of the year for each road class, also in the areas heavily used by vehicles and pedestrians. 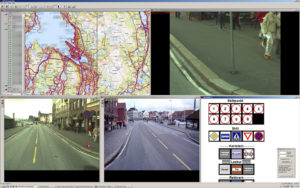 We can update your GIS information system and collect data regarding traffic safety or about road signs, bus stops, kerbs etc,. Visiminds technology gives you the exact position of any asset you wish to map or monitor. By viewing the images you can associate specific data to every asset. While positioning is being conducted your assets are catalogued and linked to other information from your GIS. By viewing you asset from the office you will avoid unnecessary field trips. Revisit locations from your office and retrieve information when needed. Less time consuming and more cost effective inventory. Since Visimind services does not interrupt traffic. 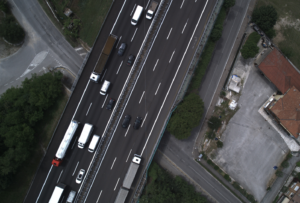 Information can be captured on highways or heavy trafficked roads during peak hours. Clearer communication. Are you talking about the same asset or location? Do you have difficulties in understanding 2nd hand information? Visimind solves any uncertainty by supplying image sequences, 3D models or positions of any object or asset you wish to discuss. Different experts can make different analysis from the same images. Collected data can be accessed from any of your organisations computers via the internet. Laser scanning is performed at the same time as the other data collection. In the laser scanned 3D models, distance, height, surface area and volume be calculated. More details are noticed. Since at the office you do not have to concentrate on driving a car or on the traffic you have more time and images can be reviewed more thoroughly. This leads to more objective assessments, as more people can notice any potential problems which can be remedied quickly. Outsourced work can be controlled from the office. You might want to confirm if the contacted job was done to specifications. Visimind data gives you an objective image of the job location. Discussions between you and contractor can be held in front of a monitor. You can bring up image history and review processes over a long period. Investing for the future. Data you order today will have coordinates and is compatible with future systems which require absolute position. An important advantage of the services offered by Visimind is that field work is reduced to a minimum, since the development of the site is available for employees in the office on client-server technology. Application of this solution makes it possible to reduce the cost of doing business.